To reflect changes under the Tax Cuts and Jobs Act (TCJA) — such as the increase in the standard deduction, suspension of personal exemptions and changes in tax rates and brackets —the IRS updated the withholding tables that indicate how much employers should hold back from their employees’ paychecks, generally reducing the amount withheld. The new tables may provide the correct amount of tax withholding for individuals with simple tax situations, but they might cause other taxpayers to not have enough withheld to pay their ultimate tax liabilities under the TCJA. So even if you received a large refund this year, you could end up owing a significant amount of tax when you file your 2018 return next year. The IRS itself cautions that people with more complex tax situations face the possibility of having their income taxes underwithheld. If, for example, you itemize deductions, have dependents age 17 or older, are in a two-income household or have more than one job, you should review your tax situation and adjust your withholding if appropriate. The IRS has updated its withholding calculator (available at irs.gov) to assist taxpayers in reviewing their situations. The calculator reflects changes in available itemized deductions, the increased child tax credit, the new dependent credit and repeal of dependent exemptions. Your investment income changes significantly. If you rely solely on the new withholding tables, you could run the risk of significantly underwithholding your federal income taxes. As a result, you might face an unexpectedly high tax bill when you file your 2018 tax return next year. 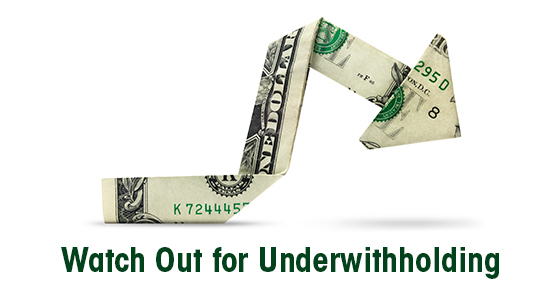 Contact us for help determining whether you should adjust your withholding. We can also answer any questions you have about how the TCJA may affect your particular situation.